First: CONGRATS to everyone is who running/ran the Marine Corps Marathon today! What a great race! Hopefully it isn’t too wet out there today. I saw folks picking up packets earlier this weekend and I got super jealous, but this morning I am cozied up in my home and sort of happy about it. As you may be able to see, I have the columns sortable by state and month, so I can say “hmmm… let’s go to Indiana! What’s there?” (No, really, that’s a question. Any answers?) Or I can say “February is looking open… let me choose a race then.” I also include the city of the race because some of these states are damn big, and I might be excited to go to one corner but not the other. And when the city doesn’t have an airport, but I’ll need to fly there, I include a reference to the appropriate airport. 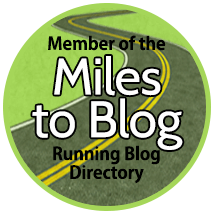 Finally, I include a note if there is a lottery or qualification requirement for the race. It doesn’t make sense to plan a whole marathon cycle around the New York City Marathon, especially if you forget to register for the lottery. 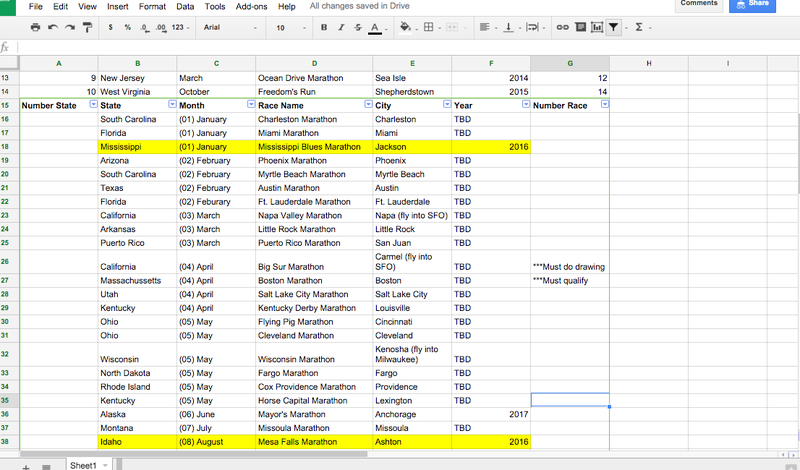 So now that 2015 is coming to a close, it is time to refer to my spreadsheet and really start thinking about 2016 and what races/states I’ll be tackling.